No other birds sleep like this! There are a dozen species of hanging-parrots — also known as bat parrots — in the tropical forests of southern Asia and Indonesia. Clad in bright greens, blues, and reds, they sleep —and sometimes bathe — upside down. No other birds sleep like this. 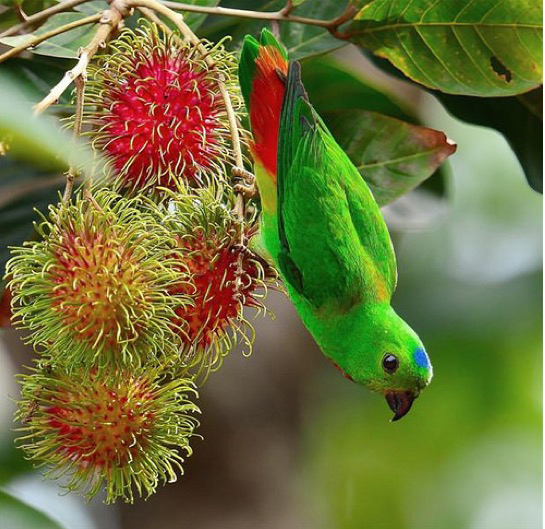 This bizarre behavior probably protects hanging parrots from predators, which are less likely to spot a tasty morsel dangling beneath the leaves. But the bird soon turns sullen, as I would, too, fed on an unvarying diet of cold boiled rice. It declines to whistle, far less to speak, and spends most of its time hanging from its perch. Suspended by its gnarled little feet. Upside down. There are a dozen species of hanging-parrots — also known as bat parrots — in the tropical forests of southern Asia and Indonesia. Clad in bright greens, blues, and reds, they actually do sleep, even sometimes bathe, upside down. Bird sounds provided by The Macaulay Library of Natural Sounds at the Cornell Lab of Ornithology, Ithaca, New York. Blue-crowned Hanging-Parrot  by Sophie J. Orzechowski.